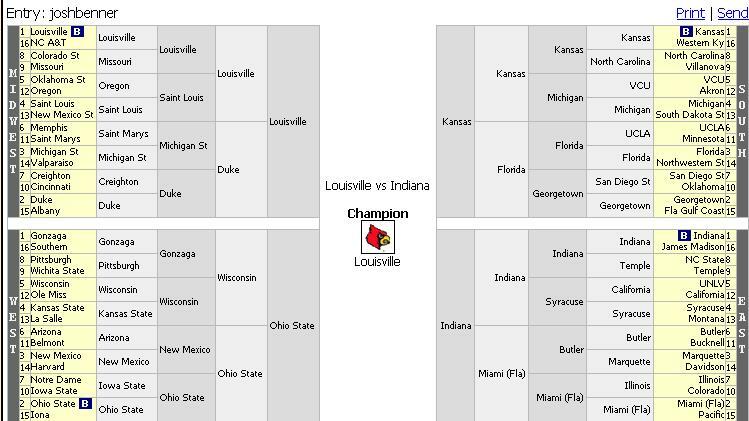 For my bracket this season, I’ve decided to go conservative with my picks. Given history and how brackets typically pan out, I feel that’s the best way to insure accuracy. While every year seems to have its own Cinderella, I feel those teams are difficult to predict and unless someone really has a hunch (such as when I picked number one overall seed Kansas to lose in the second round in 2010), I think it’s better to go with the favorites? Where’s the fun in watching elite 8 games with a bunch of teams you didn’t correctly pick?! Unlike last year, I don’t feel that there is an obvious favorite to win the entire tournament. I’ll stick with Louisville. Of the number one seeds, I have three of them making it to the Final Four. For me, for tournament picks, coaches matter. Some coaches have been historically successful in the tournament. With Gonzaga, I feel that they have not been particularly impressive in the tournament in the past decade and I just can’t put them in my Final Four. I think Ohio State is as hot as any team in the country. It’s funny because I feel that Thad Matta has arguably had four or five teams better than this current squad but the Bucks are tough and play great defense. I think that the region breaks down with favorable match ups and I can definitely see them winning their region. Florida and Georgetown are also both teams who worry me because I feel that they’re both good enough to make it to the Final Four but I also feel that they have had years in which they’ve laid eggs in the tournament. Ultimately, I feel Kansas is the safe bet in that region. Indiana is as talented as any team in the country but I also feel that they’ve not been impressive over the last couple weeks. Part of that is the fact that they played in a monster Big Ten this year. I feel that they have a pretty clear road to the elite eight. With Louisville as the number one overall seed, they play in a region which has some stout competition. St. Louis is a Cinderella type pick for some people to win the whole region. I just couldn’t go with a pick that daring considering the teams (and great coaches) who are in that region. I’m not going to be surprised if Michigan State or Duke ends up winning the Midwest but I still think that Louisville is the better overall team. I’ve seen Michigan State as a more popular pick over Duke (than vice versa). I don’t think it’s so cut and dry and I gave Duke the edge because I feel that they’re a better team overall. I think that there are a lot of very solid teams this year so I’m excited to see how this year’s tournament pans out. ‹ Is the entire Bible too epic for one miniseries?